The Reading Artillerists served as a body guard for General George Washington as he visited his troops at Carlisle, Pennsylvania during the Whiskey Rebellion of 1794 (U.S. Department of the Treasury, public domain). The Reading Artillerists had, perhaps, the fewest of ties to the 47th Pennsylvania Volunteers of all of the Related Military Units which helped to staff the 47th’s ranks over its years of service (1861-1866), but provided one of its most critical members – Lieutenant Colonel George Warren Alexander, the Artillerists’ commanding officer from 1857-1861. A militia unit founded in the City of Reading, Berks County, Pennsylvania on 23 March 1794, the organization was birthed “for the purpose of quelling the celebrated Whiskey Rebellion,” according to several accounts penned by historians and Reading newspapers. Mustering out after the rebellion’s end, members of this unit mustered in again in 1799 to help calm the “Fries Insurrection,” which erupted when Congress attempted to place a tax on the windows on American homes. When the United States declared war on the United Kingdom and its North American colonies in June 1812, the members of the Reading Washington Guards knew that they would be called upon once again to defend the nation. Sometime during this history-making phase of duty, group members changed their name again – this time to the Reading Blues. * Note: Lieutenant Colonel John Cadwalader was a son of Revolutionary War Brigadier-General John Cadwalader and the father of Mexican War Brigadier-General and Civil War Major-General George Cadwalader. All three distinguished themselves during their respective eras of service. Next assigned to artillery duty in Baltimore, Maryland, the Reading Blues manned four brass, six-pound cannon, one of which they brought home to Reading upon their return to the city. With peace concluded between the United States and United Kingdom via the Treaty of Ghent, the Reading Blues then officially stood down again in March 1815. Under reorganization, the 98-member unit re-elected Keim as the group’s captain and changed its name to the Reading Artillerists. Serving as officers with Keim in 1820 were William Darling, Peter Aurand, and Peter Reitzel as first, second, and third lieutenants, respectively. It was also around this time that the unit adopted dark gray uniforms with yellow facings. Four years later, the Reading Artillerists traveled to Philadelphia to welcome the Marquis de Lafayette, the last living French general to have fought beside George Washington during the American Revolution. The unit’s next major engagement came in July 1844, when the Reading Artillerists were put back into service to help end rioting which had broken out in Philadelphia. While there, they garrisoned the Philadelphia Arsenal and guarded that city’s Girard Bank. The Reading Artillerists assumed an even greater role in the nation’s history as they approached the middle of the 19th century. Re-mustering for duty on 5 January 1847 and led by Captain Thomas S. Leoser, 1st Lieutenant William Wunder, 2nd Lieutenant Levi P. Knerr, and Ensign H. A. M. Filbert, 90 men entered the federal service with the 2nd Pennsylvania Infantry’s Company A, and were promptly attached to the command of General Winfield Scott. After heading off for duty during America’s war with Mexico, the Reading Artillerists were stationed at the Island of Lobos. 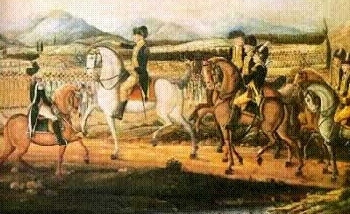 Landing with other troops at Vera Cruz on 9 March 1847, they were present for the surrender of Vera Cruz on 29 March, fought in the Battle of Cerro Gordo on 18 April, garrisoned Jalapa from May through mid-June, skirmished at the Pass of Latoeya 20 June, and were also present at Perote and Tepeyahualco, as well as at the Battle of Chapultepec. In addition, they saw action at the Gate of Belen and Citadel on 13 September and at the city of Mexico from 14-15 September 1847. By the time the fighting was over, the Reading Artillerists had enrolled a total of 99 men, and had lost 66 due to discharge or death. They returned home to their families and friends in Reading in 1848, after officially mustering out from the 2nd Pennsylvania on 28 July. Sadly, while still on duty in Mexico, the last of the Artillerists’ original founding members – Charles Evans, Esq. – passed away in Reading on 6 September 1847. He was interred with military honors in the cemetery he established as a non-sectarian, bucolic place of rest for his fellow Berks County citizens and generations of their descendants. It remains a functioning burial ground to this day, a quiet park-like place of contemplation bordered by Reading’s busy city streets. By 1855, the Reading Artillerists were engaged in yet another restructuring, as they replaced their entire slate of officers. Commanding the unit moving forward were Captain W. I. Clous, 1st Lieutenant W. W. Diehl, and 2nd Lieutenants S. T. Ketterer and J. D. Hain. They were then replaced on 2 November 1857 by 1st Lieutenant William A. H. Lewis, 2nd Lieutenant Thomas M. Richards, and Captain George Warren Alexander, who continued to lead the Reading Artillerists through the earliest days of America’s Civil War. Offering the services of his men to President Abraham Lincoln and Pennsylvania Governor Andrew Curtin on April 16, 1861 in response to Lincoln’s call for 75,000 volunteers to defend Washington, D.C. following the fall of Fort Sumter to Confederate forces, Alexander then brought his subordinates to Harrisburg in Dauphin County, where they mustered in on 20 April with Company G of the 1st Pennsylvania Infantry. Primarily assigned to guard railroads and major roads used by Union troops and to the occupation of Martinsburg, Virginia and other towns in Virginia and Maryland, they then mustered out at Harrisburg on 23 July 1861 upon honorable completion of their Three Months’ Service. * Note: Following the July 1861 muster out of the Reading Artillerists, George Washington Alexander was then re-commissioned as the second command of the newly formed 47th Pennsylvania Volunteer Infantry, which became the only Keystone State regiment to fight in the Union’s 1864 Red River Campaign across Louisiana. Wounded severely in both legs during the Battle of Sabine Cross Roads (Mansfield) on 8 April 1864, he recovered, and was honorably discharged in September 1864 upon expiration of this three-year term of service. Many of his Artillerist subordinates also re-enrolled for three-year terms of service that Summer and Fall of 1861, but fought with different units until war’s end. Several were wounded or killed in combat, including William H. Andrews who died during the Battle of Antietam on 17 September1862. Following the close of America’s Civil War, the men of the Reading Artillerists returned home to Berks County, but remained largely inactive until 1881 when concerned civic leaders reconstituted the unit. In 1892, the Artillerists were officially called up again – this time to help bring an end the Homestead labor strike underway in western Pennsylvania. 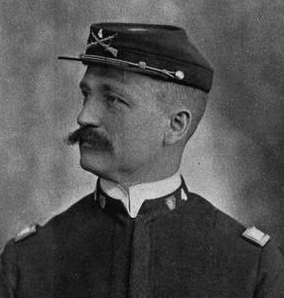 Captain Samuel Willits, Reading Artillerists (c. 1897, public domain). As the 20th century approached, the Reading Artillerists came together with several hundred other Berks County residents on the evening of Monday, 26 May 1896, to celebrate the militia’s 102nd anniversary at a special gala event at the Metropolitan Hall in Reading. The hall was beautifully and profusely decorated with the national flag in various sizes, and knapsacks, canteens, caps, accoutrements and various military insignia were arranged against the balconies and walls in a most pleasing manner,” according to historian Morton L. Montgomery, who penned and then read a history of the Reading Artillerists for the occasion. In addition to his oration, the Artillerists drilled before the crowd, which then listened to a musical program. Commanding the Artillerists at this time was Captain Samuel Willits. Around the same time that the Reading Artillerists were passing this historic milestone, Captain Samuel Willits reorganized the militia unit yet again, this time preparing the men from Reading for state service as Company A of the Pennsylvania Infantry (a forerunner of the Pennsylvania National Guard). The newly reconstituted unit was then called up in 1898 in response to President William McKinley’s call for volunteers to serve in America’s war with Spain. The men from Reading arrived in Arroyo, Puerto Rico as the town was under siege; U.S. gunboats were still shelling the town as they disembarked. Assigned to outpost duty along the Patillo road, then were shipped back home just ten days later when a peace accord was reached between the two warring nations. Responding yet again to an insurrection by angry citizens, the artillerists next mustered at the turn of the century – as Company A of the Pennsylvania Infantry at the turn of the century. This time, they were on hand to calm tensions during the anthracite coal miners’ strike of 1902 when Pennsylvania miners and their families rose up to improve mine safety and salaries. Three years later, H. Melvin Allen was appointed as the militia’s captain with J. Lewis Lengel and Edward V. Kestner appointed as his first and second lieutenants. 1. A Condensed History of the Reading Artillerists, in Reading Times. Reading, Pennsylvania: October 20, 1859. 3. Civil War Veterans’ Card File. Harrisburg, Pennsylvania: Pennsylvania State Archives. 4. Company A Has Long and Varied Military History: Name Has Been Changed Five Times Since Organization in 1794, in Reading Times. Reading, Pennsylvania: January 23, 1915. 5. Montgomery, Morton L. Historical Sketch of Reading Artillerists, Read Upon the Occasion of the 102nd Anniversary in Metropolitan Hall, May 25, 1896. Reading, Pennsylvania: Press of James E. Norton & Co., 1897. 7. Snyder, Laurie. Lieutenant Colonel George Warren (“G.W.”) Alexander, in 47th Pennsylvania Volunteers: One Civil War Regiment’s Story, retrieved online May 2, 2017.